At 2200 lumens, the Vega is the ideal addition to any digital still, video, or DSLR camera. This kit includes two universal mounts and Ikelite's unique low-loss, high-transmissivity diffuser for use with almost any system! This Vega includes a UK Style Charger. Ikelite Vega from Ikelite on Vimeo. At 2200 lumens, the Vega is the ideal addition to any digital still, video, or DSLR camera. This kit includes two universal mounts and Ikelite's unique low-loss, high-transmissivity diffuser for use with almost any system! Arm sold separately. The Vega packs a lot of power into a compact and travel-friendly package. Switch quickly between full, half and quarter powers for video, focusing, macro photography, or to use as a backup dive light. A light's power can be lost quickly when spread too thin with internal reflectors. The Vega's smooth, 65_ beam is designed to give you full advantage of the light's output when shooting macro and portrait work. When shooting wide angle, add the optional Low Loss Diffuser for a beautiful, 100_ angle of coverage and virtually no output loss thanks to a special, patented material. A ring of 6 LED indicators on the back of the light give you power level (blue LEDs) and remaining battery information (red LEDs) at a glance. 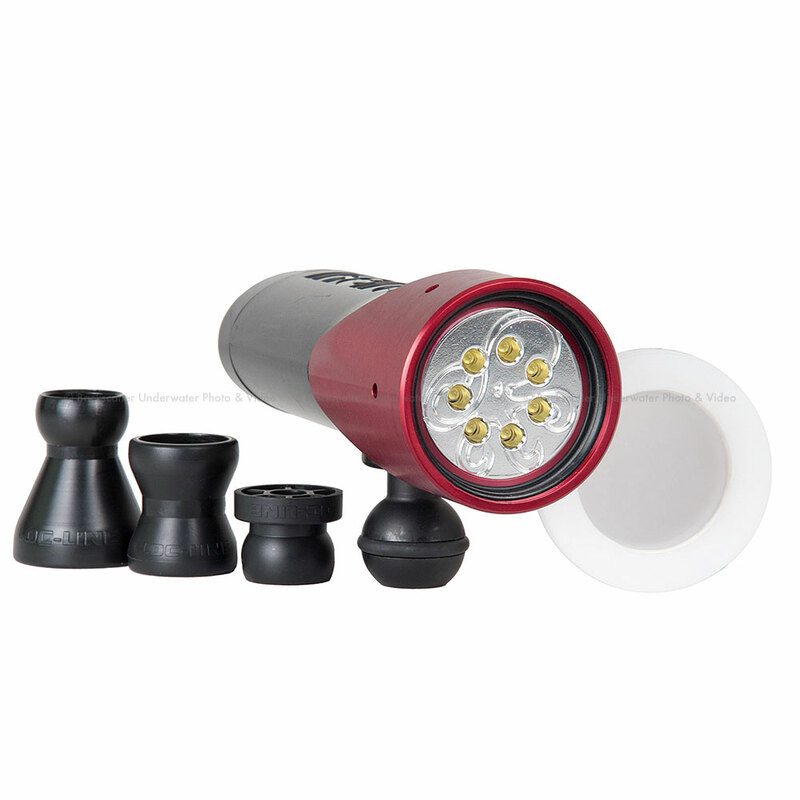 The rear LEDs are bright enough to see during a day dive yet unobtrusive when diving at night. The Vega fits as well in your hand as it does on your camera system and doubles for use as a night diving light in medium or low settings. The 1-inch ball mount is universally compatible with Ikelite, Ultralight, Nauticam, and more. Or use the included Flex Mount to mount to your existing Ikelite 1/2-inch, 3/4-inch, or non-Ikelite Loc-Line style components like those used by Light & Motion.